* Played in 26 matches for the Seminoles, with 24 consecutive starts through the end of the season. * Led the Seminoles with ten goals, eight assists and 28 points in 2018. * Ranked first in the ACC in shots per game with 4.38 and shots on goal per game with 2.12 and third in both assists and total points. * Recorded 114 shots and 55 shots on goal on the season, more than double the next best totals from Yujie Zhao. * Registered assists in back-to-back games at the College Cup, including Dallas Dorosy’s game-winner in the 2018 NCAA National Championship Game to secure Florida State’s second national title. * Scored the game-winner in the NCAA Quarterginals of the NCAA Tournament in Florida State’s 1-0 victory over No. 14 Penn State on November 23 to advance to the College Cup for the 10th time in program history. * Scored a pair of goals in the ACC Semifinals in the Seminoles’ 3-1 victory over No. 11 Virginia en route to their sixth conference title. * Assisted on Kristen McFarland’s game-winner over No. 5 Duke in the ACC Quarterfinal in a 1-0 win for Florida State. * Opened the scoring for the Seminoles in their 2-0 win at No. 6 Virginia, their first road win against the Cavaliers in program history, leading to earning United Soccer Coaches National Player of the Week honors on October 23. * Registered a goal and two assists in Florida State’s 4-0 win at Pitt. * Recorded a goal and an assist in the Seminoles’ 4-0 victory over Notre Dame. * Finished two scoring chances in the Seminoles’ 3-0 home victory over Virginia Tech, including one that landed her the No. 2 spot on SportsCenter’s Top-10 plays the following morning. * Assisted on Kristen McFarland’s game-winner in Florida State’s 1-0 win over Florida. * Recorded her first assist of the season in the Seminoles’ fourth-consecutive shutout to start the season in their 3-0 victory over Middle Tennessee on August 26. * Came off the bench to score her first goal of the year in Florida State’s 3-0 road win over Wisconsin. * Played and started in 20 games during her sophomore season at Florida State, missing just one match due to attending the FIFA Best Awards in London, England on October 23 as she was one of three finalists for FIFA Best Female Player of the Year and the FIFA Puskas Award. * She became just the third current NCAA student-athlete to be a top 10 nominee for the FIFA Best Female Player of the Year Award (Christine Sinclair – Portland, 2002; Kadeisha Buchanan – West Virginia, 2015) and the first to be among the final three finalists. * Named to the United Soccer Coaches All-American Second Team after an outstanding offensive season, tallying 41 points on 19 goals and three assists. * The 19 goals ranked second in the NCAA in 2017 and are the second-most goals scored in a single season in FSU history, trailing only Mami Yamaguchi’s 24 goals from 2007. * She recorded six multi-goal games, setting an FSU single-season record, and is already tied for second-most in a Florida State career. 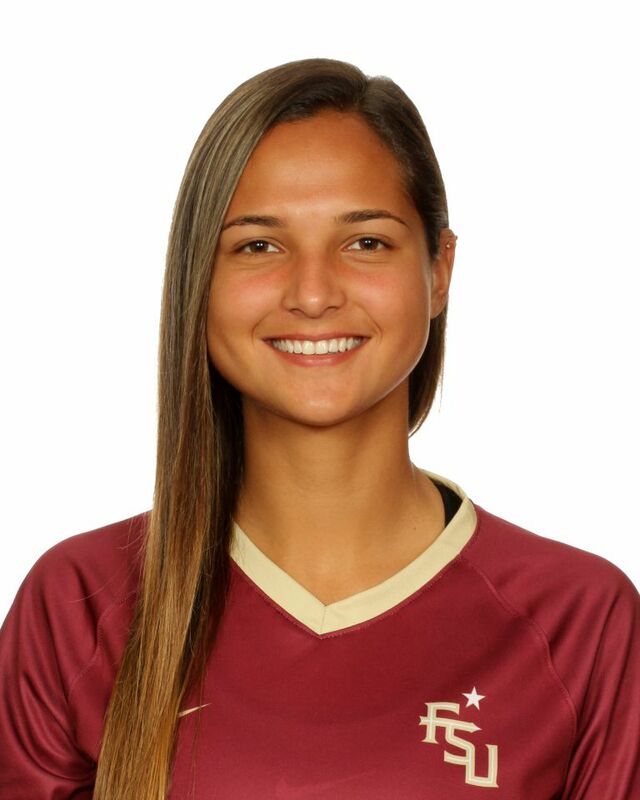 * Opened the season with a hat trick against UNC Greensboro on August 18, becoming the 13th Seminole to score three goals in a game and the first since Marta Bakowska-Mathews on September 14, 2014. * Scored two goals each in back-to-back games against Kentucky (September 3) and at Troy (September 13) as the Seminoles went 6-1 in non-conference matches in 2017. * Recorded the game-winning goals at both Louisville (September 21) and at Virginia Tech (September 24). * Quickly gave the Noles a 1-0 lead with a goal in the second minute at No. 10 Florida, as the Seminoles went on to earn a 2-0 win on the road against the Gators on October 12. * Closed out the conference season with four goals in the final three matches – one at Wake Forest, two versus Notre Dame and one on the road at Clemson. * Scored two goals in each of the first two games of the 2017 NCAA Tournament as Florida State defeated Ole Miss 5-0 and Arizona 2-0. * Played and started in 13 games her first season with Florida State, splitting time between Tallahassee and competing for the Venezuela national team at the FIFA U-17 Women’s World Cup in Jordan during the season. * Scored a team-high seven goals in 2016, including the first FSU goal of the year in the second minute on the road at No. 8 Texas A&M on August 19. * Became the second Seminole ever to score a goal in each of her first three games at Florida State, adding goals at Vanderbilt (August 25) and Middle Tennessee (August 28). * Recorded a team-high 23 shots on goal for the season on only 944 minutes played. * Posted the game-winning goal against Miami on September 18 as FSU won, 1-0. * Tied the ACC quarterfinal match at No. 6 Duke with a volley from 30 yards in the second half, allowing the Noles to advance 3-2 on penalty kicks after the game ended in a 1-1 draw. * Scored the final goal of the game in a 3-0 win over No. 17 UConn on September 8. * In her first-ever NCAA Tournament game, scored an unassisted goal in the 55th minute as the Noles defeated Samford, 4-0. * Recorded five goals in seven games at the 2016 FIFA Women’s World Cup, earning Bronze Ball and Bronze Boot honors, as Venezuela finished fourth for the second consecutive time. Castellanos now holds the all-time record for scoring in the FIFA U-17 Women’s World Cup with 11 goals all-time. * Her 2016 World Cup goal against Cameroon from the center circle was a top three finalist for the 2017 FIFA Puskas Award, given to the goal that is judged to be the most aesthetically significant, or “most beautiful”, goal of the year. Her goal was the only goal by a female among the 10 goals in consideration for the award. She was chosen as one of the three finalists for the award, along with Arsenal’s Olivier Giroud and Baroka FC’s Oscarine Masuluke. * Placed fourth at the 2014 U-17 Women’s World Cup and scored six goals during the tournament to earn the Golden Boot. * Highest goal scorer (7) at the 2014 Summer Youth Olympics as Venezuela earned a silver medal. * Helped Venezuela win the 2016 South American U-17 Women’s Football Championship, scoring 12 goals over the course of the tournament to earn Golden Boot and MVP accolades. She registered at least one goal in every match, including hat tricks against Peru on March 3 and Paraguay on March 17.